Due to high winds and windchill the Fort Worth Stock Show parade has been canceled for the second time in its history. The Stock show and Rodeo will continue as scheduled. Founded in 1896, for 122 years people from Fort Worth and all over have eagerly awaited the opening of the legendary Fort Worth Stock Show & Rodeo every January. 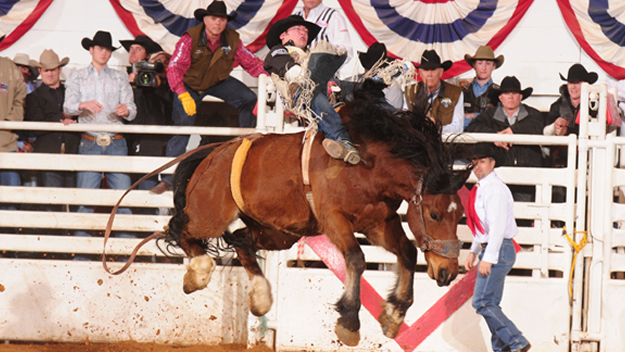 This is the last year that the Stock Show Rodeo will be held at the Will Rogers Coliseum. Next year, in 2020, rodeo performances will be moved to the new Dickies Arena designed to compliment the historic Will Rogers Coliseum while providing a venue for state of the art entertainment. There is so much going on at the Fort Worth Stock Show & Rodeo. Some of the activities you might enjoy : A bite to eat, served with your favorite beverage at the Stockman’s Cafe. An event called Swirl Around Vines Wine Wednesdays taking place on Jan 30 & Feb 06. And of course a stroll on the Carnival Midway is not to be missed. Family fun awaits your visit to the Petting Zoo or stop by the Milking Parlor to learn where milk comes from, also Planet Agriculture for more education and fun at the same time. Choose from: The Best of Mexico, Cowboys of Color, Bulls’ Night Out, Rodeo X or The World’s Original Indoor Rodeo ticket prices vary. You may purchase tickets online at fwssr.com or by calling 817.877.2420. Tickets can be purchased in person at the Stock Show Rodeo Ticket Offices at the Will Rogers Memorial Center. Locations include Will Rogers Drive main entrance, at the east entrance to the Richardson-Bass Building and the XTO Energy Gate on Harley Ave. We recommend you purchase directly from fwssr.com or Ticketmaster. Check with the Stock Show’s major sponsors, North Texas Chevy Dealers, Mattress Firm and Dickies. Visit ntchevy.com, the Dickie Outlet store at 509 West Vickery or any of the Fort Worth area Mattress Firm stores. Active and retired military and their immediate family members are eligible to receive free rodeo tickets on February 4th. Grounds admission is FREE to persons wearing Dickies apparel on January 22 and TCU branded clothing on January 31. ONE GROUNDS PASS is also available on TOLLTAG TUESDAYS to those with a North Texas Tollway Authority tag on their windshield who purchase parking on the grounds. This DOES NOT include rodeo tickets. TCU students may purchase rodeo tickets for $10 for TCU Day January 31 with a valid student ID which includes grounds admission. This entry was posted in Texas Events, Things to do in Texas, Uncategorized and tagged discount tickets for the Fort With Stock Show & Rodeo, Fort Worth Stock Show & Rodeo, Fort Worth Stock Show All Western Parade, Will Rogers Coliseum. Bookmark the permalink.